Political pundits and cartoonists are loving it. Grist for many cartoons. In some Islamic circles, cartoons would be considered more lethal than shotguns. Cars can also be considered lethal weapons. These things all float around human society. Guns, cars and cartoons. Many people live around guns. It can be a way of life. 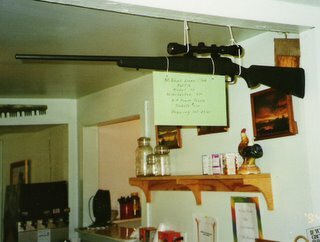 Picture shows gun on display at a mom & pop cafe in central Oregon where I stopped to eat on my 2001 "round the northwest" bicycle tour. Gun was being raffled off to raise money for the local Lion's Club. That's something one is more apt to see in rural areas. Country values. Accidents happen, but sometimes I think people are too confident in their abilities to control things. Adults are just kids playing with bigger toys. This certainly applies to cars, much of the time. Many years ago, I remember a photo in newspapers. It showed Senators passing this gun around the committee room, holding it up, checking the sights for examination. A caption read something like, "the boys with the toys." Even bicycles can be lethal, but much less likely. There is the phrase, "bikes not bombs." As for cartoons, there is the phrase, "sticks and stones can hurt my bones, but names will never hurt me." I heard that in grade school. I can't resist this. There is also a town called Cheney, Washington. Home of Eastern Washington University and another place I have passed through on bicycle.